Most of the time, we remove pictures from our iPhone to free up space. But we often forget to transfer them to our computer before this process, hence we lose the pictures forever. In other cases, we delete pictures accidentally, or perhaps reset our iPhone to factory settings without backing up. We all know that there is no way we can undo these actions. So what shall we do if those pictures are of importance, if we need them in our business or for personal use? The only thing we need do is to restore iPhone photos so that we can use them again. However, our iDevice does not have that function. But don’t worry! In this article, we will find great software. The first tool that you can use is ApowerRescue. It is a desktop program available Windows. This software is capable of retrieving data directly from your device or, if you have backed up your phone, from iTunes and iCloud backup. Furthermore, it works with many versions of iOS – from old to the latest iOS 12 and is compatible with iPhone and iPad. 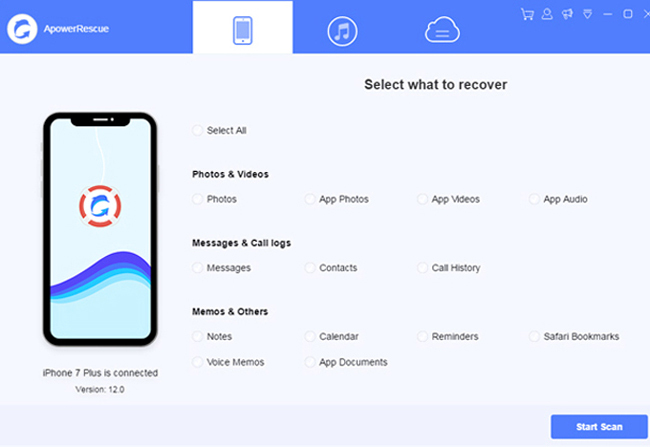 Using this application, you will be able to recover deleted messages, calendar, contacts, and other data from your phone and save them to your computer or back to your device. You can also use this program to recover deleted iPhone images. To achieve this, you need to download the software, install it on your computer and update your iTunes to the latest version first. And follow the guide below. Open the application and connect your iOS device using USB cable. Select “Photos” and click “Start Scan”. Choose the photos you want to restore and click “Recover to computer”. Select your folder location and click “Recover” to save them to your computer. Open the program and choose iTunes mode. You will see a list of backed up devices on PC screen. Choose your device from the list and press “Start Scan”. Once done, the whole backup content of your iPhone will be displayed on your computer. Choose “Photos” so that you’ll be able to see the existing and deleted images. Simply select photos and click “Recover to Computer”. Choose folder location and click “Recover”. Another tool that may help you is iFonebox. Similar to iOS Data Recovery, it also works well on Mac and Windows. It supports recovering of data directly from your iPhone, iTunes and iCloud backup. 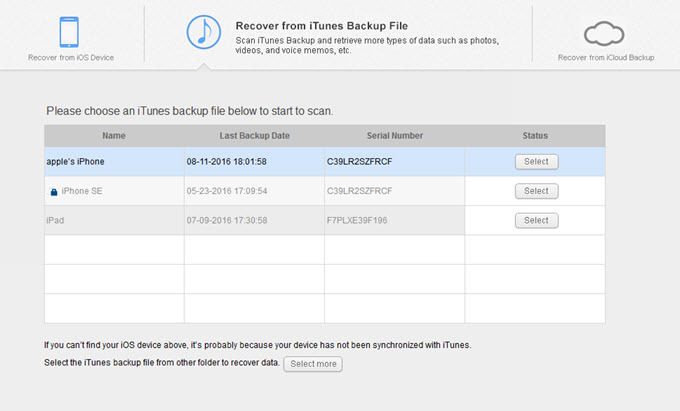 Available for iPhone, iPod Touch, and iPad, it can easily get back your lost data from them, such as contacts, messages, videos, photos, etc. To begin with, download and install the software on your computer. After that, retrieve deleted photos from iPhone with following instructions. Open the program and connect your iPhone to PC via USB cable. Click “Start” to load the files on your device. You will see data categories on your screen. Tap on “Photos” under “Media Data”. It will automatically start scanning and analyzing your files. Once the scan is completed, you will see all images. To view your deleted files only, turn on the “Only display the deleted items” on the upper left part of the box. You may now select and recover deleted iPhone images by clicking “Recover to PC”. 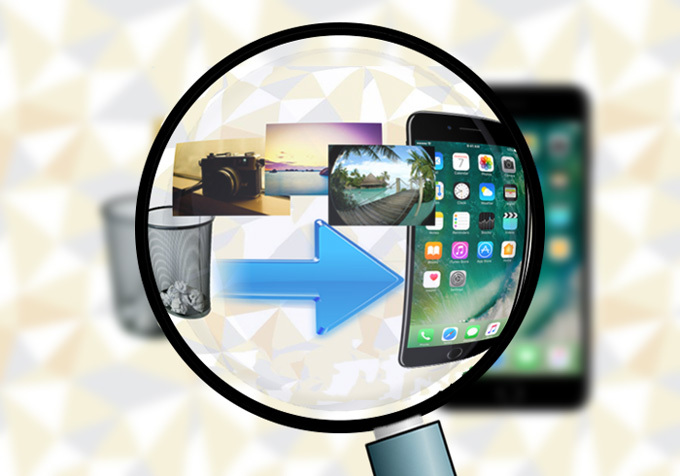 You can use these two applications to recover deleted pictures from iPhone. To compare, ApowerRescue and iFonebox are both programmed with intuitive user interface that makes the process of recovering data easier. Both are running on Windows and Mac, compatible with many iDevices. As for utility, they support recovering 16 types of data files. As for speed, iFonebox operates faster as it directly scans your phone while the other one analyzes the device first and then scans it. Like any other program, these two also have limitations. First, they cannot recover everything that has been deleted on your device. Second, neither is free. Though there’s a free trial version that you can use, some features are available only when you buy the program.